William performed February 11th, 2018 on Show 349 in Boston, Massachusetts. 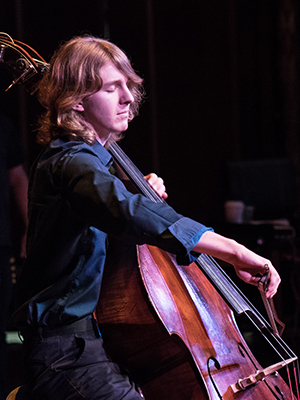 William McGregor (double bass), 18, lives in Malvern, Pennsylvania and studies at the Juilliard Pre-College Division with Albert Laszlo. He is a senior in the University Scholars Program of the PA Leadership Charter School. He was the Gold Medal winner of the 2017 Stulberg International String Competition in May 2017, as well as a 2017 National YoungArts Foundation Finalist. He has performed in master classes with Edgar Meyer, Harold Robinson, John Kendall and many others. William’s hobbies include all sports (especially Detroit Tigers baseball and Michigan basketball), collecting baseball cards, and singing.